Passenger Pickup/Dropoff: Available at curbside, car cannot be unattended. If you need more time, park in the Hourly Deck or use the free Cell Phone Waiting Lots (see 'Parking Map). For Paging and Information call 704-359-4013. C/DIAL, a 24/7 multi-lingual information center, can be reached at 704-359-4910. The Welcome Center / Visitor Services can be contacted at 704-359-4027. For Airport information 24/7 call 311; outside of Mecklenburg County call (704) 336-7600. C/DIAL. TSA Pre-check & Priority Lanes: Eligible TSA Pre-check passengers of US Airways, American, Delta & United travelers may access the TSA Pre-check lane at security checkpoint B for expedited screening. Priority Lanes: 'Preferred' or 'Elite' airline customers may use these lanes for faster access through security checkpoints B & D.
- Checkpoint E: Standard, Mon-Fri 6am-9:45pm; Sat/Sun 6:30am-10:15pm - with SPP & employees. - Concourses A through E surround the main terminal - no shuttle service is needed. 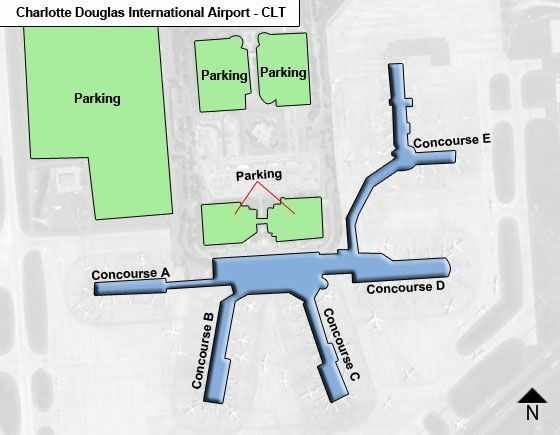 - Ground Transport: All modes of transportation at Charlotte Douglas International, except CATS buses, are located at the curbside of the lower baggage claim level of the main passenger terminal. CATS buses pick up in front of Zone D baggage claim. International Arrivals: Unless you have gone through US customs clearance by participating airports in Canada and the Caribbean, you need to go through passport check, retrieve checked bags, go through customs clearance and - if transferring to another flight - re-check-in bag (the tag should indicate layover and final destination Airport Codes). The Arrivals level houses the baggage claim with carousels A1, A2 & A3 to the left, B & C in the Center and D & E to the right , with an Information counter, ATM machine, 'Special Areas' between B & C carousels. Concessions are located close to the entrance doors. The Departures level of the main terminal houses the check-in facilities at the entrance and 5 security checkpoints thereafter or each of Concourses A, B, C, D & E (checkpoints A & D open 4:15am, B & C open 5:15am). Food & drink, retail concessions, & ATMs are available on the Departures level, its Atrium & at all concourses; while Charging Stations are disbursed throughout the Concourses. All boarding areas offer food & drink & retail concessions and other amenities. The Atrium is a glass-enclosed structure within the Departures level - with a tree-lined boulevard dotted with comfortable white rocking chairs and surrounded by concessions & services (including a chapel on upper level, TSA pre-check pre-enrollment center and the the USO lounge). Concourse A with gates A1-A13 is currently served by Air Canada, Delta, Frontier, JetBlue, Southwest, United & ViaAir airlines. Concourse A can be accessed from the ticketing level. Near gate A6 is an ATM & a charging station. Concourse C with gates C2-C19 is currently served by American Airlines only, and can be accessed from the Atrium. The American Airlines Admirals Club & Business Center is at the entrance of Concourse C. Charging stations are at /near gate C4, C10 & C15 and an ATM at C9. Concourse D with gates D1-D13 is currently served by American Airlines & Lufthansa, and can be accessed from the ticketing area. It handles all international arrivals without customs preclearance. A charging station is at D3, an ATM near D7 and currency exchange at D1/D2. Concourse E with gates E1-E38 is currently served by American Airlines only, and can be accessed from the ticketing area. The y-shaped gateway starts with gates E1-E9, and then divides: to the right to gates E10-E19; to the left to gates E20-E38a-b. A charging station is near E11, with an ATM in close proximity thereto. - The American Admirals Club & Business Center is located near the entrance to Concourse C.
- The USO Center is near the Information counter in the ticketing area. - A wide range of food & drink, shops & services are available in all areas of the terminal.